After leading the NFL in sacks in just his second NFL season, Falcons edge rusher Vic Beasley is looking to do the exact same thing in his third. 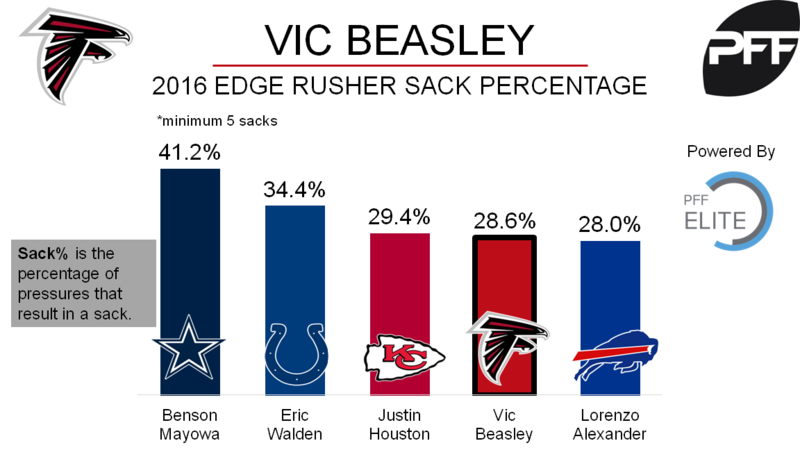 Beasley made this known when he responded to a tweet that posed the question of who would take the sack title in 2017. One reason for Beasley’s increased sack totals in 2016 was that he finished his quarterback pressures at a very high rate. Of Beasley’s 56 total quarterback pressures this past season (ranking 17th among all edge rushers), 28.6% of them resulted in sacks, which was good for fourth among all edge rushers with at least five sacks. The league average sack percentage among edge rushers in 2016 was 15.2%.